The truth is, in 6th grade, me and all my friends went vegetarian. I joined PETA (mostly for the free stickers) and avoided chicken nuggets and burgers (the only “meat” I ate in 6th grade). My 11-year-old self was pretty stickler about not eating meat, but I still ate lots of junk food. This meant cheese quesadillas (highly processed american cheese was my favorite), tater tots, pb&j (not natural peanut butter), french fries, chips, and cookies everyday. I was very picky and wouldn’t eat “leaves” (salad), beans or any other healthy food to save my life. After 6 months, I quickly realized that I missed chicken nuggets and burgers, so I gave up vegetarianism. For the last few weeks I’ve been on the fence about a decision to go vegetarian. My family would support me in my decision, but they would still prepare and purchase meat, which kind of defeats the purpose, since they won’t be buying less meat, even though I won’t be eating it. Also, I am very interested in eating a plant-based diet, in other words, vegan. However, my parents would not enjoy the cost of buying almond milk and special protein sources just so one person (me) in our family will eat it. I would gladly prepare vegan meals for my family, but my mom and dad would be the only ones who would eat it, I’m sure. I’d have to make a vegan meal for me and another meal for the rest of the family, since I do 90% of the cooking in our home. This means more time/work/energy/money. One more thing, if I suddenly change my eating habits, I’ll have to bring my own meals, turn down snacks and always be asking “is it vegan/vegetarian”? And I hate being a bother to people and don’t want people to think I’m being a snob because I won’t eat the food that EVERYONE else is eating. Those of you that eat gluten-, sugar-, dairy-, meat-, animal-product free etc. how do you deal? Also, I really REALLY wanted to do the 7 Day Vegan Challenge, but last week (before I knew about the challenge), I bought a big tub of Feta Cheese and I don’t want it to go bad (I’m the only one in our family who eats it). My dad would die if he heard I wasted food so I could go vegan for a week. Bottom line: I’m not going 100% animal-product-free this week, however, I have challenged myself to try some new-to-me vegan meals and recipes. Mama Pea and Angela, I’m looking at you. This morning I took Chipper on a brisk walk then did my weight-lifting routine for my workout. I refueled with a Green Monster. 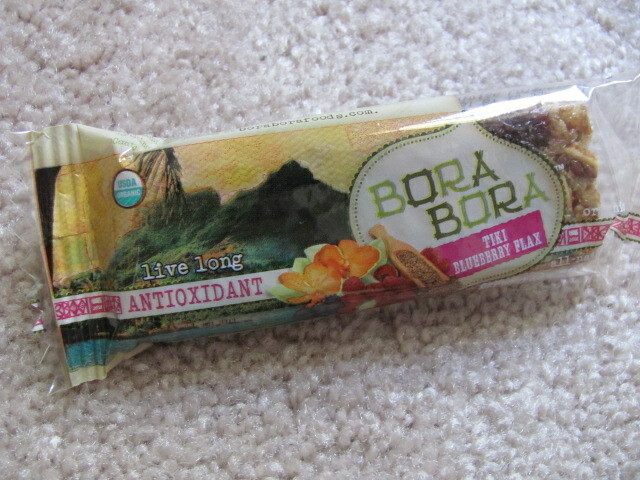 Before Spanish class I snacked on this lovely Tiki Blueberry Flax bar from Bora Bora. 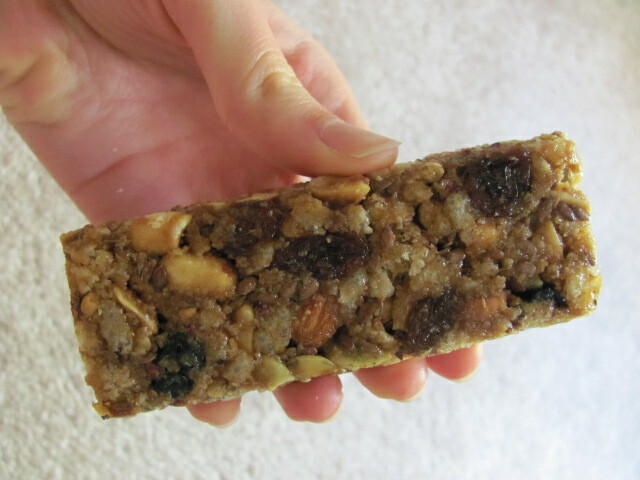 Excellent texture, yummy taste, lots of yummy ingredients. After Spanish I came home and made a SALAD BEAST. I love salads because you can make them HUMONGOUS and yet they’re still low in calories! Depending on what you top them with of course. 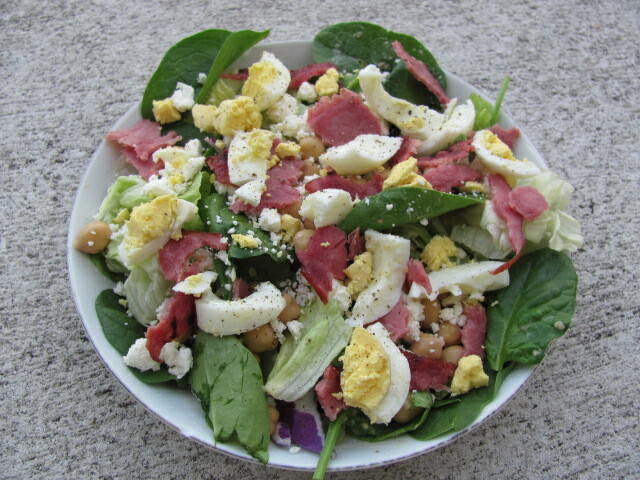 This salad was bursting to the brim with spinach, romaine, chickpeas, feta cheese, a crumbled hard boiled egg, turkey bacon and hummus dressing (1 Tbsp. hummus thinned with a little water). BEST SALAD EVER. I used to think I could never make a decent salad, but practice makes perfect and I’m really getting the hang of it now! I’m growing sprouts!! Supposedly sprouts are SUPER SUPER good for you and the nutrition content of foods can be increased up 500% if you sprout it. 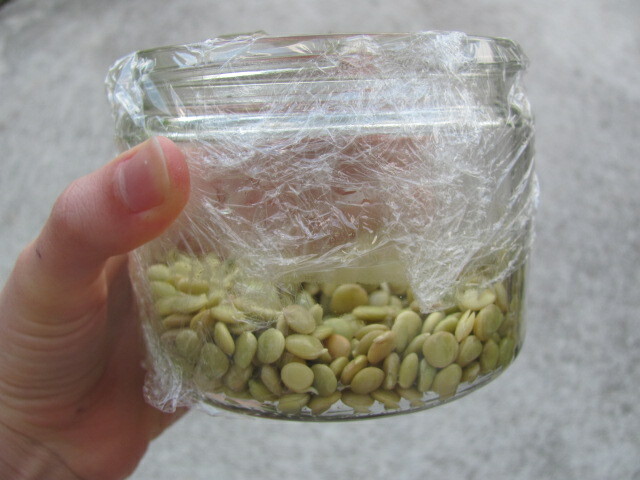 The most common do-it-yourself-sprout is alfalfa, but I’m doing lentils. I’m not even sure my sprouts will work, who knows!? It SHOULD work, and If it does, I will be sure to do a tutorial! Wow, this was a bit wordy of a post, but the new diet lifestyle stuff has been on my mind for a while and I’d love to hear your thoughts! What’s your favorite (EASY) 🙂 vegan recipe? Have you ever done sprouts? Thanks for commenting, Alex! I think the conclusion I am coming to is that I want to eat more of a plant-based diet, but I’m not going to give up animal products. It just wouldn’t make sense for me right now. my fave vegan recipe would be oats I suppose! Your green monster looks so good! Sprouts are So good for you! so cool you are growing some!! I went sugar free today and totally thought of you! I might have to join you each month as you go sugar free for a week, but I am not sure if I can make it a whole week! Ah, there is so much I want to say about this post! Haha. I can’t though, cause I’m commenting from my phone and it’s really challenging. I’ll have to send you an email or something when I get home from Utah. 🙂 Your concerns about veganism make a ton of sense, believe me. I struggled with those things a lot, and I still do. Being a vegetarian is really quite easy in comparison to veganism. There are vegetarian options EVERYWHERE and people are very understanding. Veganism… that’s a bit harder in terms of eating in public. It’s also hard when you go to eat at people’s houses… but you just deal with it, and I always ask if they’d like me to bring anything because of my diet. Other times I just make exceptions and eat the dairy, because I hate complicating things and sometimes there’s not much you can do. There are lots of options at restaurants, like Chipotle, Jason’s Deli, Einstein. Bagels, Pei Wei, Panera, etc. Ah, there’s so much I want to say! Haha, sorry, this wasn’t very helpful. Just my random thoughts. That sounds like a great lifestyle for me. Although, I think I’ll eat meat, if I WANT to, but lately I haven’t been eating barely any at all! I think it is sometimes a lot to ask your family to go out of their way for your eating habits, but I think you should try vegetarianism/veganism for a few days, and see what happens. I’m pescatarian, but I eat vegetarian most of the time and eat vegan meals a few times a week too. I don’t think people always need the labels – you could eat mostly vegan and volunteer to cook a few vegan meals a week for your family. Love the salad!! You’re so right, they’re so low in calories and yet so delicious if you do them correctly. Sorry about the situation you’re in. Sounds tough. I’d say trying going vegetarian for a couple days/week and see how that goes before you choose one way or another. I agree. Think of it like a tester. I personally wouldn’t do it. Meat isn’t bad and protein is very necessary. It’s a very personal choice but if it makes you happy then go for it. I’m in the same situation as you are with trying to decide if I should become Vegan or not. To help me decide I have been eating Vegan one day a week. I’ve been a vegetarian for about 1 year and half now and I love it 🙂 It’s really not hard at all. I’ve just recently gone gluten-free after finding out I’m intolerant and that’s been a lot more challenging. But I feel amazing 🙂 Just do what’s best for you girl! And slowly ease into. If you quit meat cold turkey (pardon the pun), you’ll be more likely to go back to it! Hope this helps. My agave brownies are vegan so delicious! and only 3 ingredients check them out on my blog! Your smoothie looks incredibly creamy and blended! Honestly babe, I wouldnt. Just becasue everyone else is, you do not have to. I think a lot ( not everyone) gets obsessed here on the food blog about having the perfect diet. Truly. Its UNhealthy. Ya know? I enjoyed real ice cream tonight after dinner. I think its one of lifes pleasures. not saying you could make it unproccesed but why cut it out? Is it something really attainable or just a fad you’ll do for a few months. This was beautifully stated, and I completely agree. 🙂 you go girl! And honestly, I think that the best thing you can do might be to actually just try to incorporate more vegan meals into your FAMILY’S plan… if they’re up for it, that is. 🙂 Like, ask if they would consider buying just one meal’s worth less of meat a week. it can make a pretty big impact. Other than that, do what you can and what feels comfortable for you… It’s not worth making huge sacrifices or anything, and I do think every little bit counts! I used to be vegan, and it ultimately gave me a really bad vitamin D deficiency. I probalby could have supplemented, but now I eat a largely-vegan but just-vegetarian diet. I kind of toy with eating meat on occasion because I really think that completely harshly limiting yourself in any aspect isn’t necessary or “good”, but I can’t QUITE bring myself to actually eat meat after all this time! great post Kayla. I think you’re right – although people say all the time ‘you have to eat how YOU want to eat’ be it veganism or not, how you interact with others makes a big difference and if your family ain’t in on it, it won’t work! i even find that now and i don’t even live with my family. being vegan, i think, is something I could only do long term if I had some sort of animal welfare consciousness. i don’t, really – or not enough to make me stop eating meat – i just eat little meat and good quality, free range, etc rather than cutting it out. since being healthy, lean and fit on a vegan diet is more time consuming and difficult (NOT impossible though! ), i think it’s not something I could do if it was just for plant-based benefits. i just eat more veg! favourite vegan meal – mama pea has some cray cray banana millet muffins that are the bomb – check them out! Thanks Erika. I totally understand about “falling into labels”. I don’t want to label my diet, but I’m thinking I’ll try to eat more plant-based foods, yet I’m not going to give up animal-products altogether. If I want it, I’ll eat it. But after watching some very sad documentaries, I don’t know how much meat I’ll want to eat anyway! I say go for it and don’t worry about what others think! I am vegan,gluten intolerant and trying to cut down on sugar. While it takes more effort than eating what everyone else does,it’s worth it.Everyone who knows me knows what I do and don’t eat and I feel that if anyone has a problem with it too bad! I have to do what’s right for me,not them. I suggest if you go go vegetarian/vegan you read up on the nutrition aspect of it. The book Becoming Vegan is very good and the author has a website as well http://www.theveganrd.com/. Good luck no matter what you decide! I’ve never sprouted anything, I’m worried I’ll ruin the ingredients or grow mold or something! Sounds like they are so healthful though! I’m having a giveaway- come check it out! You know, since I can’t have sugar/caffeine because of a heart condition, people are very understanding. It’s easy to turn down dessert because I just explain I can’t have sugar. And people who know me, don’t even bother offering anymore because they know. However, I have recently realized that dairy isn’t for me (my tummy doesn’t like it!) so while it is easy to switch to dairy-free products at home, it’s difficult to deal with when going to other people’s houses or out to eat. Just this last Sunday I was at my Aunt’s house to celebrate a birthday and she was SO sweet to go out and buy me sugar free ice cream so I could have dessert too. Except that I’m not eating dairy anymore (but of course she didn’t know that). I couldn’t bring myself to tell her that I wasn’t eating dairy because she had gone and gotten something especially for me. Just asking for a small serving works in that sort of a situation. It’s not easy, it’s always awkward, but people who really care about you will be understanding. Note to self: tell aunt I’m no longer eating dairy, haha! Thanks for your comment, it helped a lot. Hi! I just found your blog, love it so far. I’ve been vegan for almost a year, and vegetarian for almost 5 years. It’s so easy to be vegetarian, but I fell into the junk food trap at first too. I love being vegan and I feel it is the healthiest thing for my body. Not wanting to be wasteful, I finished everything in my house that wasn’t vegan and then didn’t buy any more of it. You shouldn’t car about what people think, they’ll be more intrigued then anything. They won’t think you’re a snob, but it may make them uncomfortable to not provide an option for you at events and stuff. Just always be polite, explain, and bring your own food if necessary. It’s just food and no one should really care or judge you for it, unfortunately it happens, but if they care about you they won’t mind. Dinner options when cooking, you don’t have to whip up crazy vegan recipes that will take a lot of time and effort, just make some sides that everyone will love and you can eat on your own. If being vegetarian/vegan is something you really want to do for what you believe are the right reason then go for it. If you ever want to talk about it you can email me with questions and stuff, I’d love to answer them. However I agree not contributing to the purchasing of meat is a very important aspect of vegetarianism/veganism, I think the most important aspect is doing this for yourself and the animals. By not eating meat you make a statement and respect animals, which is a very strong feeling that will eventually enable you to do more and more. we ɑll knoա media is а great source of facts.